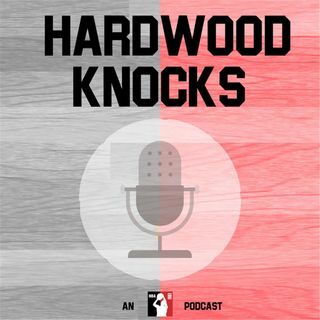 Hardwood Knocks takes a break from the division-preview grind to answer a bunch of listener-posed questions that take them around the entire NBA and then back again. The topics of this edition's inquiries include potential trade candidates; a Rudy Gobert-Draymond Green debate; Nikola Jokic's passing; Frank Ntilikina's development; scoring-title predictions; surprise teams; LeBron James' title window; and so much friggin' more! As always, please ... Maggiori informazioni subscribe to and rate Hardwood Knocks on iTunes. You can also find us on basically anywhere podcasts are offered. And as 50 Cent's biopic suggests: Follow Andy Bailey (@AndrewDBailey), Dan Favale (@danfavale), the show (@HardwoodKnocks) and NBA Math (@NBA_Math) on Twitter or die trying.